My husband doesn't really do birthdays, which for a long time has caused a little bit of a struggle between us. My family sees birthdays as an excuse to spoil and pamper the birthday boy or girl, which R is somewhat unused to. I think we've finally managed to strike the right balance, with me cooking him a nice meal and giving him not too many presents. On previous years, I've taken him out to various restaurants to celebrate, but having finally realised that he would actually rather not go out, I thought I'd bring the restaurant experience in-home and have a go at a much more refined style of cooking. For a starter, I made the recipe below. I absolutely adore the combination of sweet, roasted butternut squash and crispy, fragrant sage. Scallops too are a little mouthful of heaven when briefly seared on either side so they melt in your mouth. As a combination, all three go deliciously together, and it looks delightful too. For me, perfectly cooked scallops will always have that "wow" factor. Preheat the oven to 160°C, then peel and dice the squash into approximately 1" cubes. Coat with a little olive oil, and season with salt and pepper then roast for 30-40 minutes until tender. Push the squash through a potato ricer or whizz it up in a blender with a little chicken stock then sieve it and keep warm. Dry fry the pine nuts until golden and set aside, then pat dry the scallops and season with a little pepper. Heat a drizzle of olive oil in a frying pan and when sizzling hot, sear the scallops for about 90 seconds on each side. While the scallops are cooking, melt the butter in a pan and fry the sage leaves until crisp. 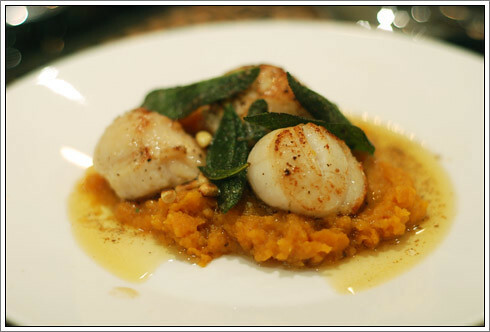 Arrange the scallops on a dollop of butternut puree, then drizzle with the sage butter and sprinkle the toasted pine nuts on top. Serve with a delicious glass of crisp Viognier.